Though my town is relatively small, it has a serious road safety problem because of a major highway that runs straight through its middle. Traditionally a group of villages spread throughout the oasis that surrounds what used to be a river—but that is now dry most of the year—much of the town has grown to envelope the thoroughfare. “Centre,” as it is called, is where one find the regional bus station, intercity grand taxi stands, and the central market. Over time, the once sprawling town has become long and thin as it follows the road for several kilometers..
People in the greater surrounding areas who travel from one larger urban center to another have no choice but to come through here, be it by bus, taxi, or private vehicle. There are no other adequately serviceable roads. That being the case, we get quite a bit of traffic throughout the day, so road safety has been an ongoing concern. The nearest large city is about an hour away, an ongoing concern for locals in need of emergent medical care. In fact, there are three such cities, one northeast, one southeast, and one due west, but all distant. We are in the middle of empty, high desert plains. Further compounding the traffic issue, is the local secondary school that educates not only the city residents, but also serves as a regional, residential school for rural villages. The lycée, or high school, has a student population of roughly 2,000, many of which ride their bicycles to and from school. 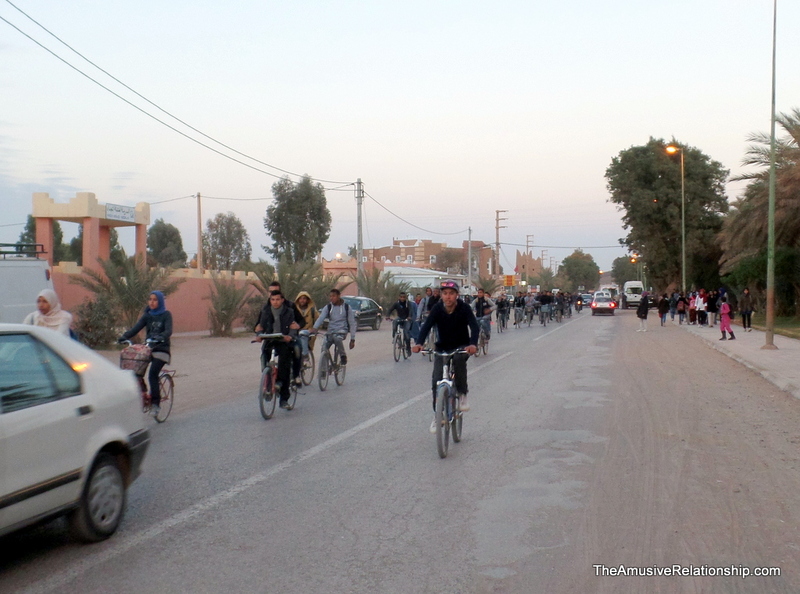 Rural Moroccan schools do not typically serve lunch, so mid-day, as well as before an after school, the entire student body goes home to eat and most take the main road. This means, in addition to the usual vehicular traffic, there are now hundreds of two-wheeled teenagers occupying most of a lane. Plus, Morocco being an affectionate country, many of these students ride side-by-side holding onto each other as they simultaneously talk and ride. Sometimes, they ride four or five across and take up the entire lane. A new, wider road has been a long time coming. As with all large, governmental projects, it has been ever so slowly coming to fruition. Finally, last month, financing was secured, a schedule was put out, and work will begin soon. In the meantime, however, it is still dangerous. 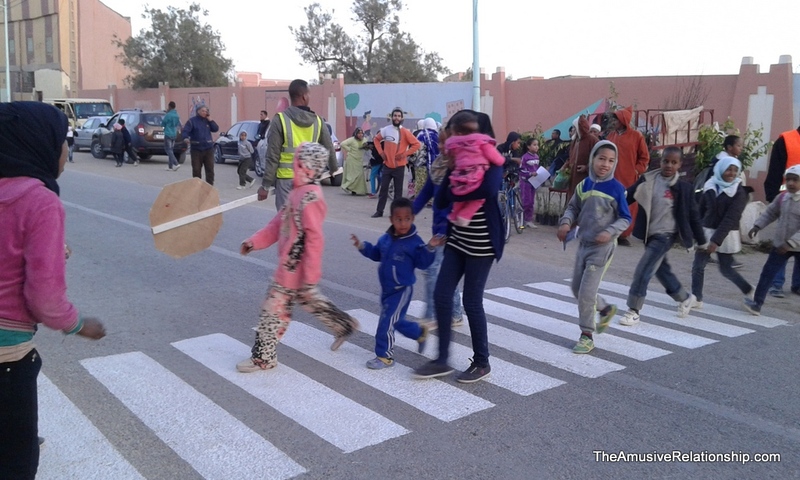 So, several local associations teamed up for Morocco’s Traffic Safety Week in order to bridge the gap until the new road is scheduled to be finished in April 2017. To that end, we worked on several simultaneous projects. First, we traveled to each of the local schools—primary, middle, and secondary—along with the local gendarmerie and government officials to speak about being safe on the road. Then, near the primary schools, we painted crosswalks. There were none before, so crossing the busy road for lunch was precarious. With the crosswalks in place, thanks to Noa’s suggestion, we trained local people to be crossing guards. We even made ‘stop signs’ to be used by parent volunteers at the crosswalks so they could more safely stop traffic and let groups of children cross. Several murals were painted at key points along the road as reminders to drive safely. Also, throughout the project, we would stop traffic, with permission from the gendarmes, to hand out fliers and remind them to be careful. So far, it’s been a reasonable success. Drivers are now stopping for people at crosswalks, teenagers on bikes are riding in smaller groups, and I’ve even heard people along the road yelling “hyawanatI” (animal) to drivers who are driving unsafely. Sure, these are temporary measures, but until the new road comes, hopefully we’ve helped to make our town a little safer. Below are some images of our projects.